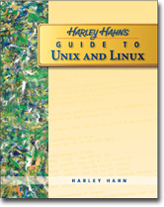 Welcome to the home page for instructors and students using Harley Hahn's Guide to Unix and Linux. Everything on this Web site is available to both teachers and students with the exception of (1) the answers to the exercises, and (2) the PowerPoint files. To access these two features, you need a user name and password, which you can get from your McGraw-Hill sales rep, if you are an instructor. A quick overview of the book listing every chapter and appendix. This page gives you a feeling for what this book has to offer. 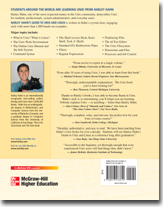 To help you examine the book fully, this page contains a comprehensive listing of every major topic covered in the book. The information here will help you plan which sections of the book you want to teach in class and which sections you want to assign for home reading. The Unix Model Curriculum is a detailed plan for teaching all the important concepts necessary for an introductory course for Unix or Linux. The Unix Model Curriculum was designed to help you decide which topics to teach and the order in which to teach them. Along with the curriculum, you will also find detailed course outlines which you can use as a resource when planning a course. For each chapter and appendix, this section contains a valuable list of online resources related to the material covered in the chapter. You'll find a wealth of reference information, much of would, otherwise, be difficult to find. These resources are useful to teachers who wish to enhance their lectures, and to students with their own Linux or Unix systems who want to explore beyond what is covered in class. Every chapter of the book ends with a set of exercises, specifically designed to help your students review and master the material in the chapter, including abstract concepts. This page describes the three types of exercises you will find in the book, along with suggestions as to how you might want to use them. You will also find links to pages containing the answers to all the exercises. If you are a Unix or Linux student, you need to understand Unix history in a way that is relevant to you. This timeline is a chronological summary of the events that are most important to students learning Unix and Linux for the first time. All of the events in the list are discussed within the text. This page contains a list of all the known errors in the book along with corrections. If you find an error, please let me know (instructions are on the page). If you are the first one to report the error, you will receive recognition. To help you with your preparation, here are links to PowerPoint files, one per chapter. Each file contains all the figures in that chapter. Simply delete the figures that are not relevant to the material you plan to cover.